This is a rarity for me and when I say "rarity" I mean RARE, as in perhaps only a dozen times in the 40 years I've been reading. 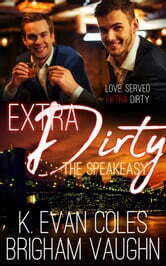 I loved Extra Dirty even more than book 1 in the authors' Speakeasy series, With a Twist. That's right, Jesse and Cam burrowed even deeper into my heart than Will and David. When I read a series that has a different pairing in each entry, the first couple is 98% of the time my favorite the same as when a character is recast in the middle of a television series, not neccessarily because the first is actually better but having been the first to be familiar with they stand out more. I guess it has more to do with the way a person's mind works. Anywho, back to Extra Dirty. I knew that whenever Jesse Murtagh was going to be given his own book that it would be something special just because he has been such an amazing and interesting supporting character from the first time we met him way back in Coles & Vaughn's Tidal duology. His spirited nature and look on life is infectious and whether we want to admit it or not, most of us wish we had more of that lease-on-life in our daily dealings. I also think its been pretty obvious that no matter how much fire is between Jesse and his business partner Kyle McKee, they were never going to have the be-all-end-all kind of connection, course that doesn't mean the fire can't be lit now and then. As for Cameron Lewis, well what's not to love about Cam? He may be a bit younger than Jesse but he's just as intriguing and spirited to catch Jesse's eye. I love the connection of him being the music teacher to Carter's kids(for those who don't know who Carter is he and Riley are the stars of the authors' Tidal duology and a must read because well WOW!). Now, New York may be jam-packed with people but sometimes life really is a small world and whether you believe in coincidence or fate, we meet the people we need to meet at exactly the right time, which is what puts Jesse and Cam in each other's sight. One thing I love most about the pair is that despite everything they don't try to change each other and sometimes that means they don't communicate like they should but I'd rather read a story of communication problems than changing someone. I firmly believe that if you don't like the way the person is that you feel the need to change them then why are you with them? I guess its just a pet peeve of mine so when authors don't use the "changing people" concept I love the book even more. As I said, this meant that there were times that communication wasn't there which left me wanting to bang their heads together but then if everything came easy-peasy for Jesse and Cam, Extra Dirty would have been a very short short story instead of the amazing dramatic yet fun-filled full length novel that it is. It's hard to imagine Carter/Riley and Will/David as secondary characters after they've had their own stories told but they fill the roles expertly and really prove how friends are family. Speaking of family, I just want to add how much I loved the fact that both Jesse and Cam's families were supportive, friendly, and amazing, especially Jesse's brother and sister-in-law. Their scenes may have been limited but they owned every page they were on. One last note: yes, Speakeasy is a series that can be read as standalones due to a different pairing for each entry but it is my personal opinion that it is a universe(I say "universe" because I think Tidal duology that told Carter & Riley's journey is included) that is even better read in order. I found that knowing each couple's story makes the friendships and connections flow better, however, I can also honestly say you will not be lost if you start with Extra Dirty. Whatever order you read this in you definitely should experience it because K Evan Coles and Brigham Vaughn have brought to life an incredibly amazing world of characters that you don't want to miss out on knowing.